Bolts to either 45G or 55G Main Tower Section for Mounting Antenna Rotor, Beacon Lights and other Attachments. Drilled to fit the Hygain and Yaesu rotator bolt patterns. The plate is not drilled for nor is it designed for use with a thrust bearing. Field Drilling may be necessary to accomodate the Specific Item. 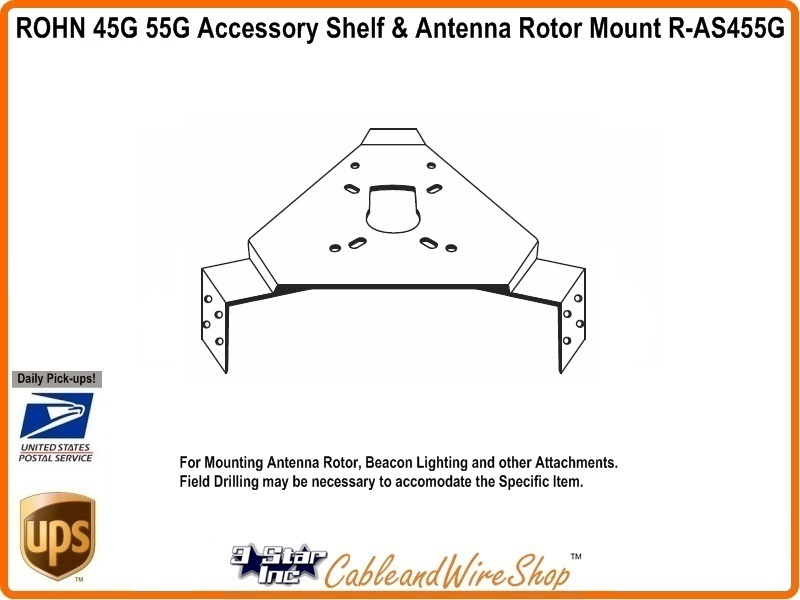 Note: ROHN AS455G Top Single Accessory Shelf is Galvanized Steel with (3) "U" Bolts to attach to all 3 Side Rails anywhere on a 45G 55G Tower Section for Mounting the Antenna Rotor below the Thrust bearing Mount on the 45AG4 55AG4 Flat Cap Top Section, or on a 45G 55G Main Tower Section below the BPL45G BPL55G Top Cap Thrust Bearing Plate. For Any Application, mindfull of the Pre-Drilling of the Plate to accomodate Popular Rotors and other Items, Field Drilling may be necessary to Fit your Specific Application. The AS455G can be Mounted with Beacon Lighting anywhere needed inside the 3 Side Rails of any 45G 55G Tower Sections. American Steel. Buy ROHN, Buy American.